Easy. Medium level. Skiers in parallel. Difficult. Good skiers or snowboarders. Always ski on slopes where you can control the speed, appropriate to your level. Never ski on slopes closed to the public. The behavior on tracks has a series of rules of conduct that must be known: tracks users should avoid dangerous situations caused by their own behavior or by faulty or inappropriate material. 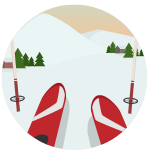 You must adjust your speed to the conditions of the track and our personal limitations, pay special attention to overtake another skier or as we join a track, avoid unnecessary stops, when we move on foot do over the edge and always respect the signals and indications. In case of accident the skier is required to give notice to the security services and protect the injured, identify and testify.